Over 40 years ago Tamiya released a kit of the M60A2, but in point of fact it was actually the M60A1E1 version with a bore evacuator and other differences from the production tank. It was also scaled to fit their overscale M60A1 hull and as a result was a terrible model to try and build; no matter what the modeler did it just did not look right. Last year three kits of this vehicle were announced: Academy, Dragon, and AFV Club. The Academy one had a nice looking turret on their Tamiya hull clone so still kept the faults of the parent chassis, but the turret was a much better effort. The AFV Club kit has not been released yet, but now the Dragon effort has reached the market. 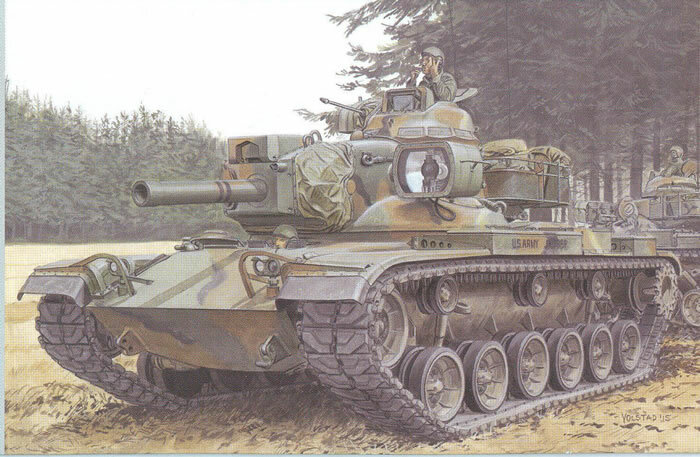 There have been some negative comments about this kit already published on the Internet, and while some are perfectly valid (as they come from former M60 tankers who were intimate with the subject) some are the usual whines. I will try to sort through them here. The kit is a new mold product that does make use of some of the parts that DML created for their M48 and M103 kits, but only where the three tank lines share common parts. There are some misses on the new parts, such as the CBSS: it should be 38.4mm wide in scale but here it is only 32.5mm. The launcher tube is correct in length but a bit larger in diameter than it should be in scale. One reviewer did note that the actual M60 hulls used only had a single fueling port on the right side and the kit comes with two so the one on the left should be removed (behind the turret race and in front of the engine deck). The drivers also come without the three cleanout holes which were common when the M60A2 went into service. Also note that the rear engine access doors (part D36) should have the fitting for the snorkel tube on them (U shaped notch on the right upper door section) as that was pretty standard for M60s by that time; the one in the kit does not. The turret shapes are fairly close and the bustle rack comes with nicely done mesh from etched brass - 13 plates to be precise. A clear styrene vision block is provided for the commander’s cupola to make finishing it easier (tinting the inside with a clear paint such as Tamiya Smoke may be a good way to solve the clear transparency issue). While DML is a past master at using its DS Plastic for many bits, oddly enough so far with their M48/M60/M103 kits they are stingy about providing the canvas mantlet covers for these vehicles. While many M60A2 are seen without the cover, by the time they were fully invested in service most of them had one for the main launcher assembly. Alas, one is not provided in the kit. Construction of the model is pretty straightforward, but while both early aluminum and late steel wheels are offered in the kit (all with separate tires in grey styrene) only the aluminum ones were used on the A2s (the others found their way onto the later AVLBs on the same chassis). The kit does provide the proper side-loading air cleaners but seems to be missing the later quick-release fitting for them, but this can be added from strip styrene. Finishing directions are pretty sparse; two options are given, both in MERDEC Winter Verdant (dark green, field drab, black and sand) but with no bumper codes or unit ID. One vehicle has serial numbers and the other is named ACES WILD. One would have thought someone would have used the MASSTER finish in USAREUR with the olive drab, earth, black and red brown colors with either black or white stars and markings but that was not an option in this kit. A small sheet of Cartograf decals is provided. Overall this is a bit of a disappointment as a bit better research would have made for a better kit with more finishing options. What is provided is not too bad, but it will take some work to make a first-class model from the kit. (And it is FAR better than the ancient Tamiya one which they keep re-releasing...) .